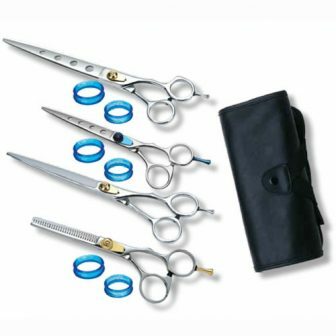 • #75 Ear and Paw Shear 4.5"
Everything you need for complete shear grooming! 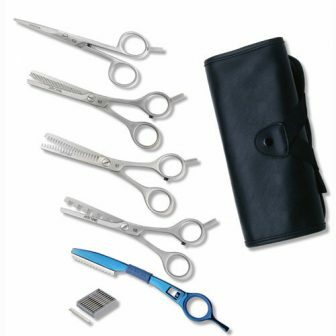 This Deluxe shear set by Antoine de Paris ® is great for the groomer for large and small breed needs! 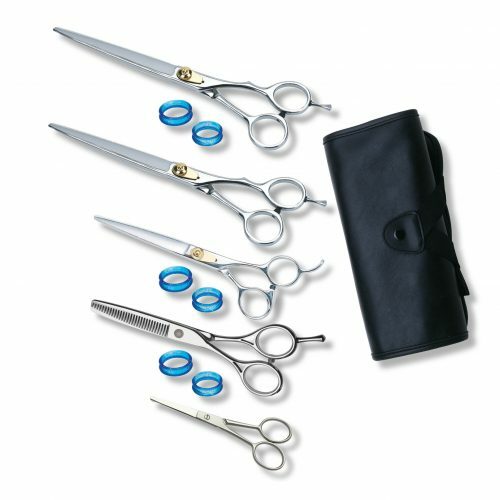 It includes 5 shears in lengths most commonly used in grooming. The # 812 8″ straight shear will make fast work of even the largest breeds. The # 815 8″ Curve is ideal for the natural curves in the backsides, and chest areas. The # 964 Shear 6.5″ is razor sharp and very comfortable to use, with its offset handle and fixed finger rest great for small to medium breeds. The #930 Thinning shear 6.5″with its 40 teeth will allow you to thin the fur, add texture and blend like a pro. The # 75 ear & Paw shear has a safety rounded tip, for those delicate areas. Comes with removable ring inserts to customize the grip for your hand, (not available for # 815). 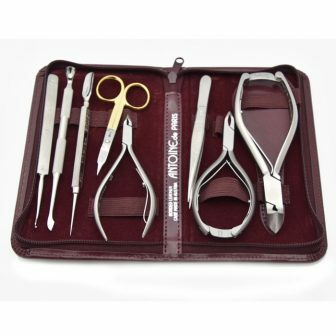 All of your new tools are protected in the leather tri fold case # 109. 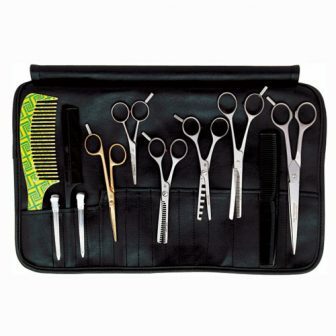 It has a snap closure and can be laid out on your work table for convenience or stored safely in your drawer and holds more than 15 tools or combs.